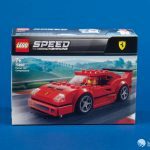 We’ve come to expect a certain format for LEGO Speed Champions box art, and this one is no different, featuring a racing scene on the front, with several more angles and photos of the real-life car on the back. 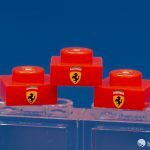 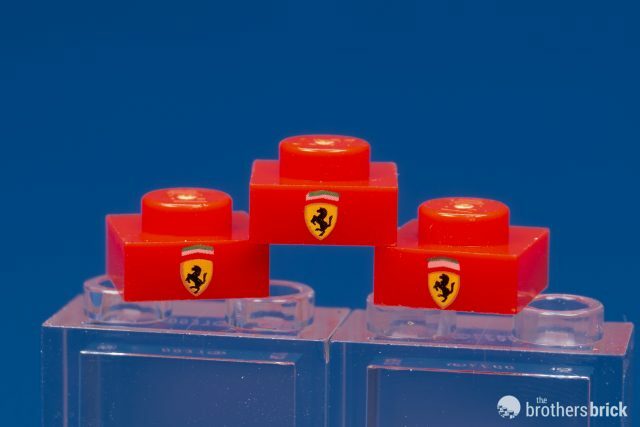 One interesting difference from other LEGO packaging is that the licensor — Ferrari, in this case, obviously — affixes a holographic sticker to the side of the box indicating that it’s an official Ferrari product. 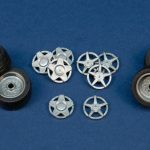 The parts come in several unnumbered bags, plus two paired sets of hubcaps (a total of four sets), with the chassis and sticker sheet loose alongside the instruction booklet. 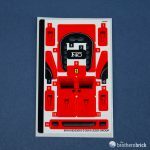 Looking at the finished, mostly red model on the box, you wouldn’t expect a huge sticker sheet, but the included sticker sheet does include extensive insignia, intakes, and other subtle details. 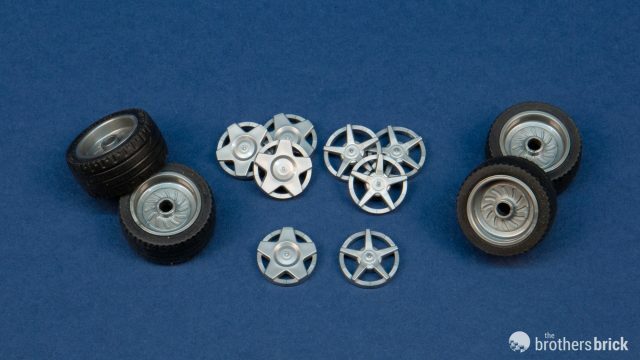 LEGO has been including two sets of hubcaps in separate polybags since the first Speed Champions sets as well, so when one vehicle includes variants that use hubcaps from two different polybags, you end up with four sets in the LEGO set. 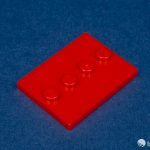 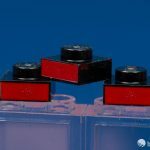 The Collectible Minifigure stand is beginning to show up in a variety of places as an integral part of creating relatively smooth 4×3 surfaces, and this set includes this existing part in red for the first time. 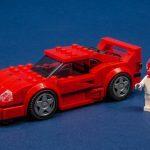 The set includes parts to convert the Competizione model into the standard road car. 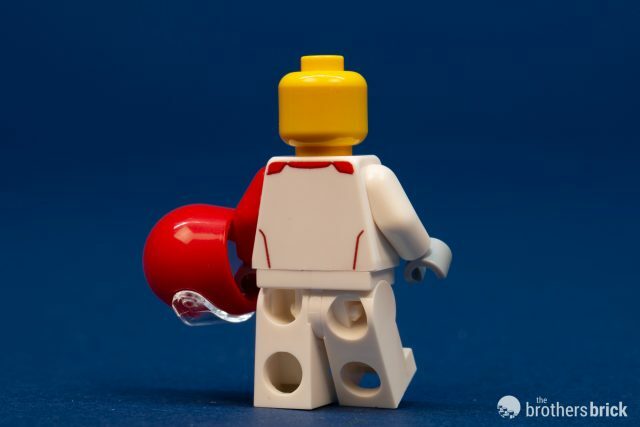 We’ll return to that in the next section of the review. 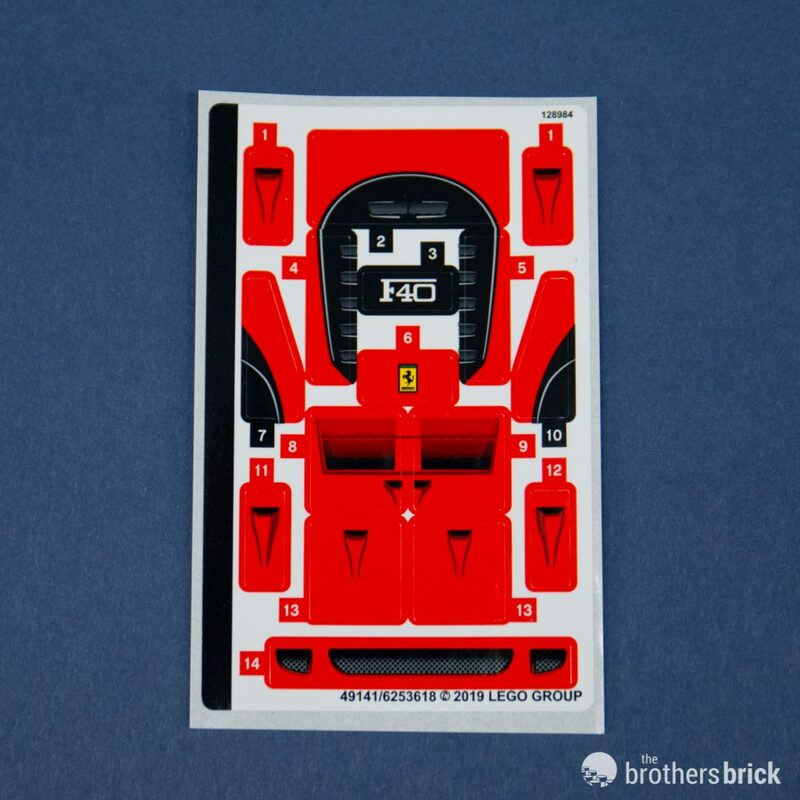 The version of the Ferrari featured on the box is the Competizione model created for racing teams, with black accents on the base red body color. 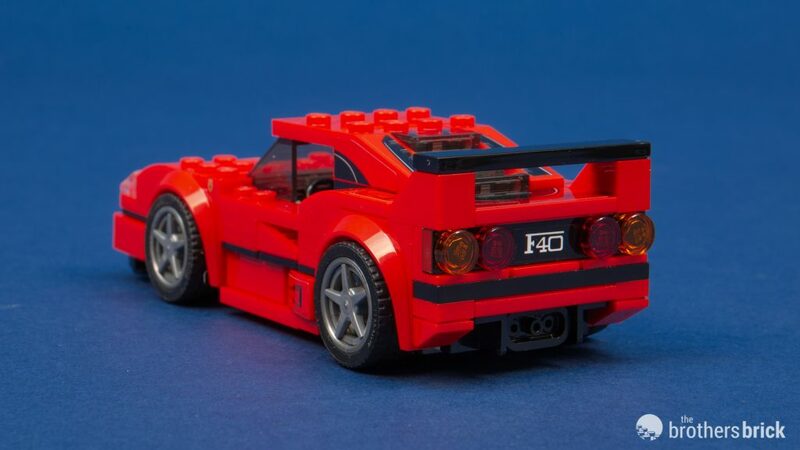 Many of the earliest Speed Champions sets didn’t take advantage of the many small curved pieces that have been introduced in the past several years, and looked like square-ish 1980’s era supercars, even though they depicted contemporary, sleek cars like the LaFerrari. 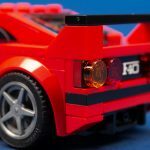 The squared-off side panels, front bumper, and back end of the car all capture the look of the 1980’s Ferrari perfectly. 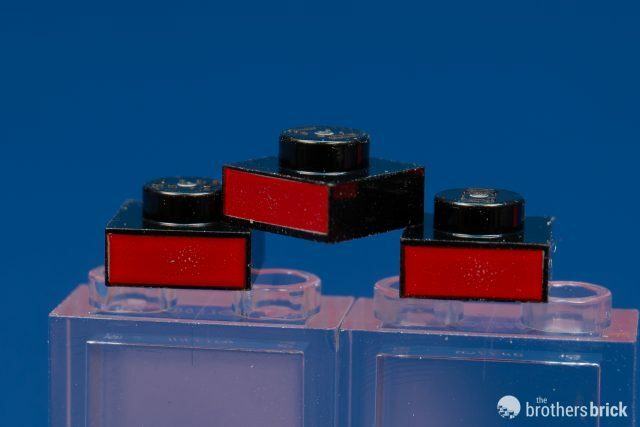 The rear window is built from stepped 1×2 trans-smoke tiles between heavily stickered 1×4 slopes. 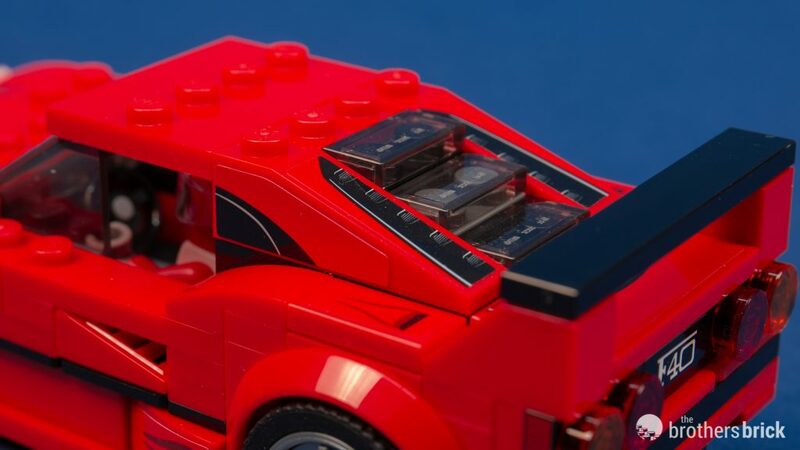 By removing the black 1×6 tile on the spoiler, all four hupcaps, and part of the front hood, you can convert the default Competizione model into the standard road car. 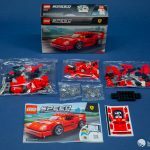 The differences are subtle, and the nearly all-red color lacks some of the visual interest of the race car version with its larger proportion of black accents, so it’s no surprise that the Competizione was chosen to be the “hero” version for the set’s name and box art. 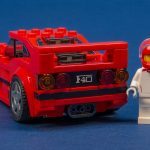 The road car lacks the race car’s diffuser, so the rear fender piece gets swapped out as well. 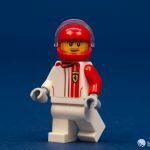 The driver minifig is fairly standard-issue, though the torso printing is new. 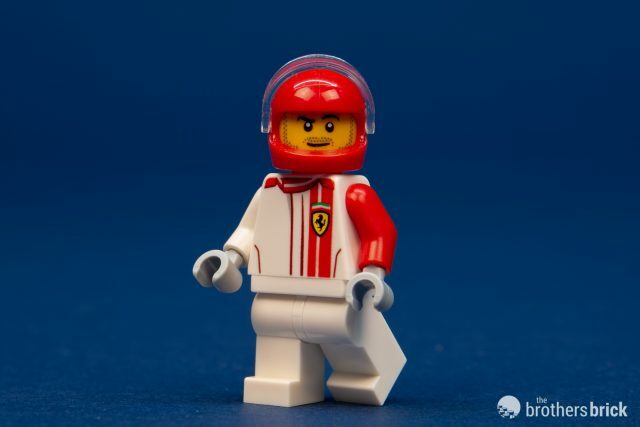 He wears a racing jumpsuit with red stripes and the Ferrari logo. 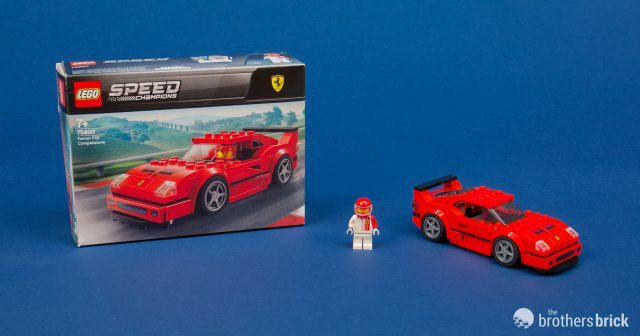 It would be an odd lineup of LEGO Speed Champions sets not to include a Ferrari. 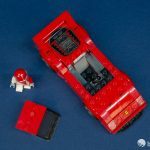 And we’ve mentioned in previous reviews that it’s lovely to see historically significant vehicles included in the lineup. 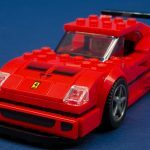 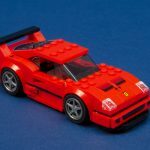 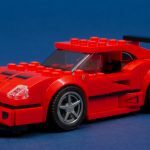 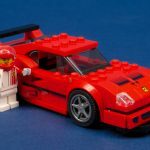 However, as many times as the F40 may have been featured on “Top Gear”, the F40 is an odd choice as one of the few standalone historical Ferraris, when the beloved Testarossa has yet to make an appearance in LEGO form. 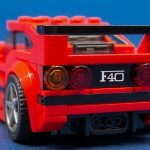 Admittedly, the F40 with its angular spoiler is a more striking car than the iconic Testarossa that appeared in 80’s TV shows like Miami Vice. 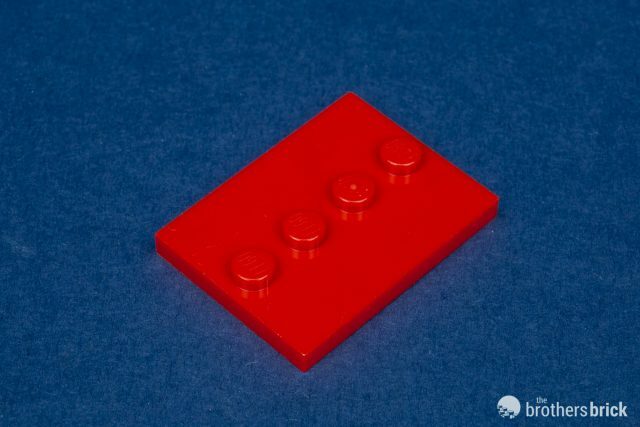 It also feels a little odd to be recommending a LEGO set for one or two unique parts — but the side-printed 1×1 plates are simply fantastic. 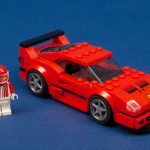 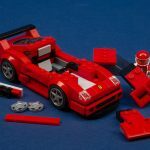 Overall, then, for about $15, you get nearly 200 parts to build two versions of a historically significant (and to some nostalgic) Ferrari from the 80’s and early 90’s. 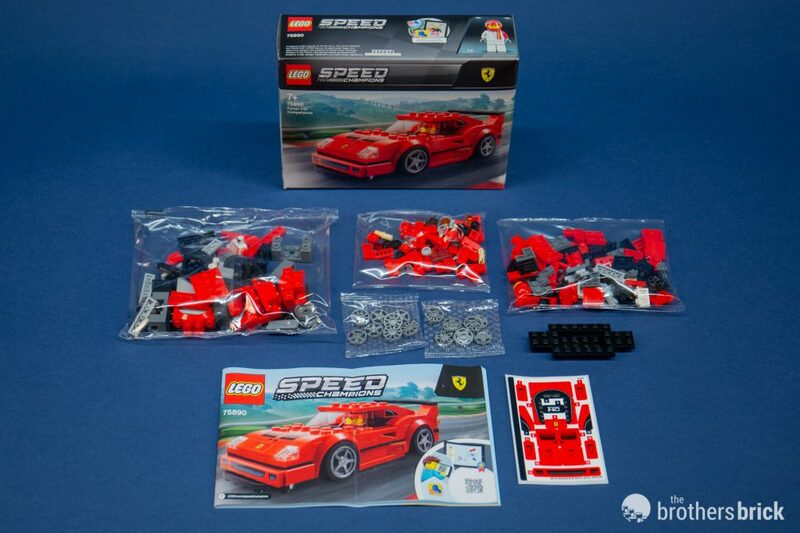 Even if you’re not a LEGO Ferrari or Speed Champions completionist, you can’t go wrong with this new (old) Ferrari. 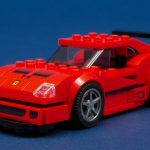 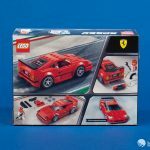 LEGO Speed Champions 75890 Ferrari F40 Competizione includes 198 pieces with 1 minifig. 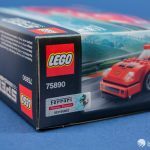 The set will be available January 1st, 2019 from the LEGO Shop ($14.99 in the US | £12.99 in the UK | $19.99 in Canada), Amazon.com, BrickLink, eBay, and elsewhere. 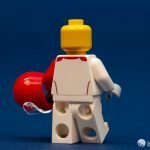 The torso printing is not new. 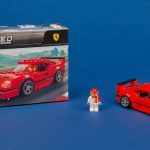 It is the same as the Classic Ferrari 250 GTO Race Car Driver, just on a different color torso. 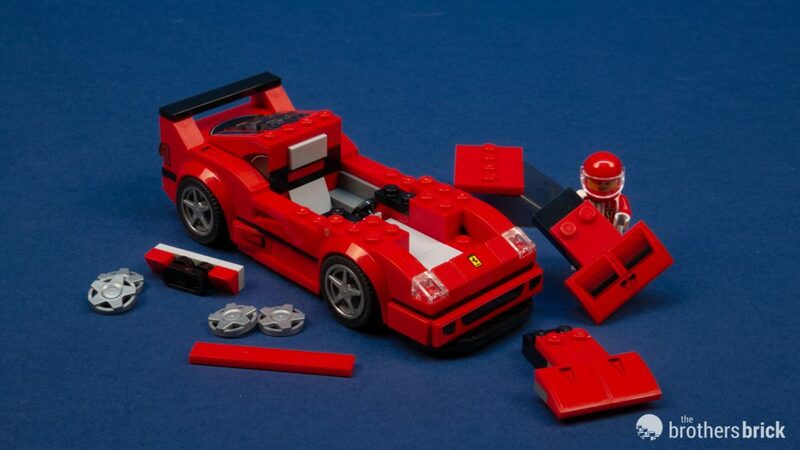 It still looks good but alas Lego is once again rehashing torso prints year after year. 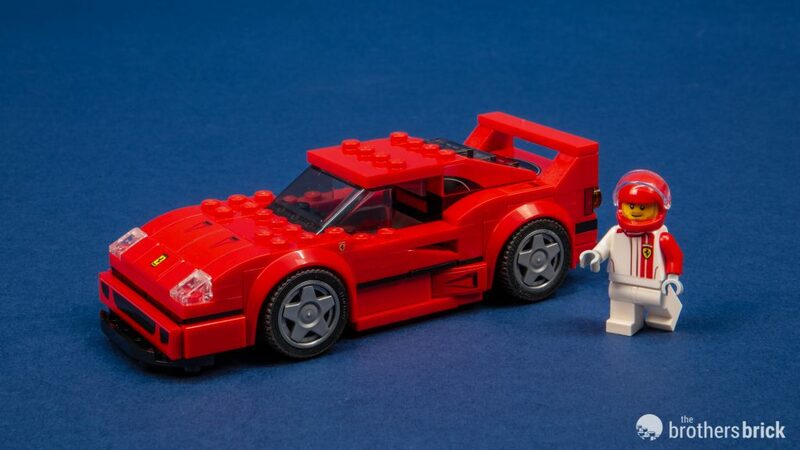 I really don’t understand it either, especially for Ferrari sets. 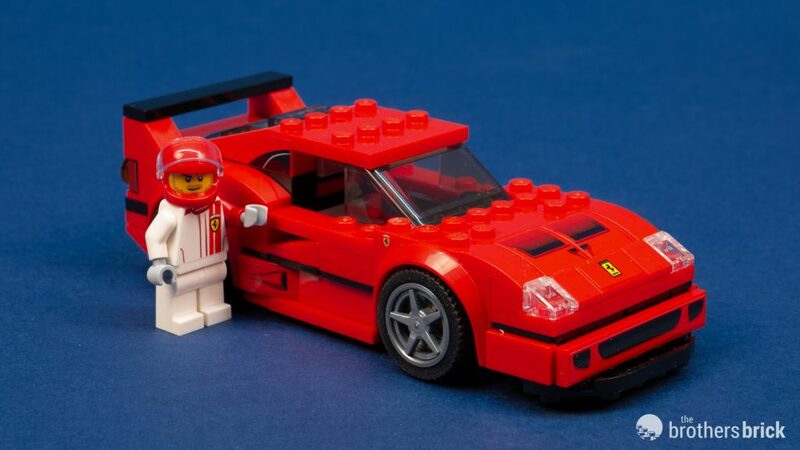 It not exactly like Ferrari doesn’t have a catalog featuring apparel that Lego could use to pull ideas from. 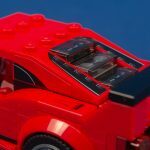 Really wish they would have printed or stickered the sides of the trans clear cheese slope headlamps -the real car’s lamps are pretty much just on the top surface of the hood, not wrapped over the edge. 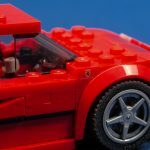 Otherwise this is a nice capturing of the vehicles proportions and style in small scale Lego. 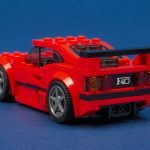 And it leaves room for folks like me to buy one for display, and maybe a couple of others to try and make our own improvements to. 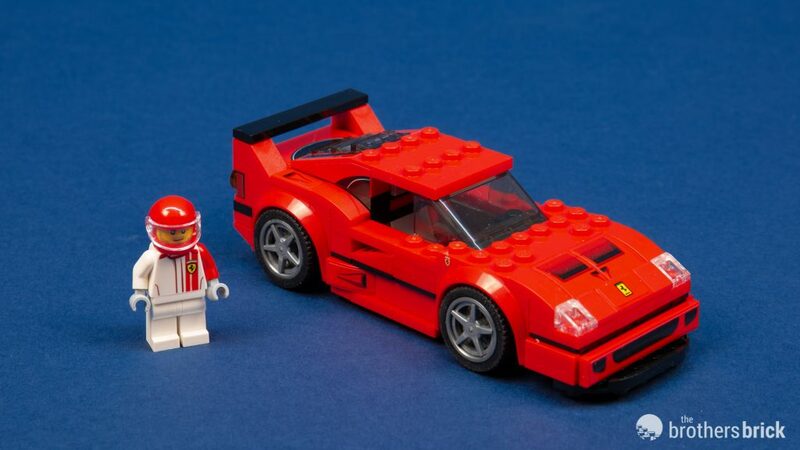 I’ve been hoping for an F40 and a Countach. 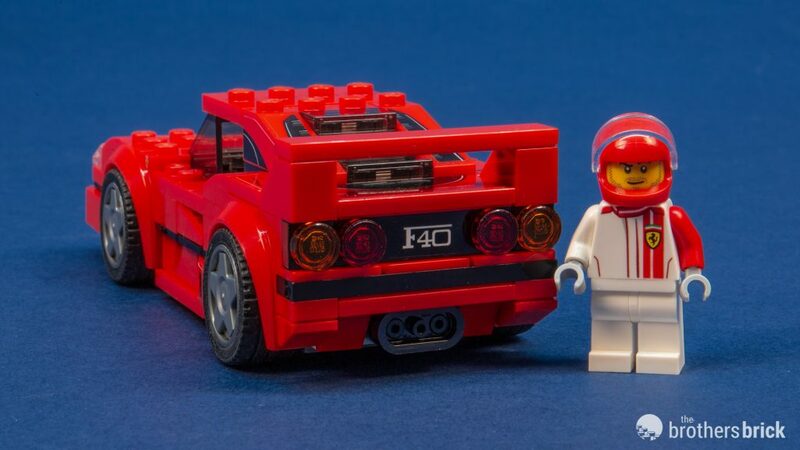 We’re half-way there, boys!